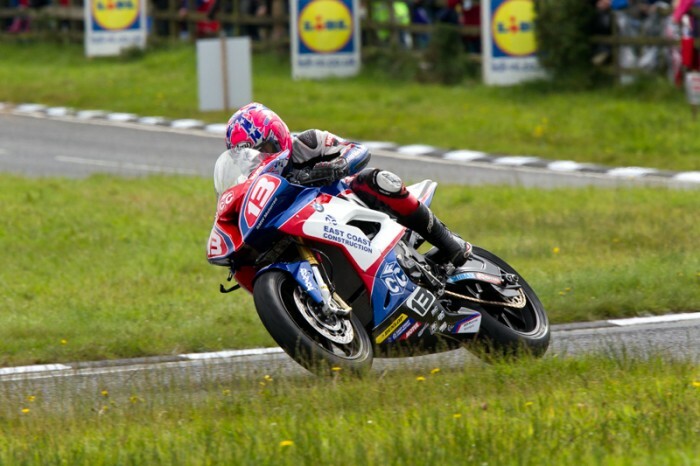 Lee Johnston (East Coast Racing/Burdens BMW) took his maiden Ulster Grand Prix on Saturday morning when he got the better of Peter Hickman (Briggs Equipment BMW) in the Superstock race by just 0.09s. The duo hit the front on the opening lap with Hickman leading for the first four laps but Johnston went ahead on lap five and with a new lap record of 132.793mph, he got the verdict. At the end of the first lap, Hickman led Johnston and Ian Hutchinson with Keith Amor in fourth and Michael Dunlop back in fifth. Brother William had also made a sluggish start and was back in sixth. Second time around the front two were edging away and Michael Dunlop was now up to third pushing Hutchinson back to fourth. Indeed, the PBM Kawasaki rider only lasted one more lap before pulling in to retire. At the head of the field it was all about Hickman and Johnston although at one stage it looked like Dunlop would be able to reel them in. As it was, Johnston hit the front on lap five and despite Hickman’s best attempts he fell just short on the run in to the line. Dunlop took third, some six seconds adrift at the chequered flag, with William in fourth on the Tyco BMW. Ivan Lintin had worked his way up to fifth on the RC Express Racing Kawasaki but he crashed out at Quarterlands on the final lap and that allowed Amor to edge out David Johnson and Dan Kneen. Dean Harrison dropped back on the final lap to finish eighth with Russ Mountford and Bruce Anstey in ninth and tenth.